JERUSALEM — White House adviser Jared Kushner on Thursday kicked off a renewed push by the Trump administration to restart Mideast peace talks amid signs of growing Palestinian impatience with a lack of progress so far. Kushner, who is President Donald Trump's son-in-law, was holding separate talks with the Israeli and Palestinian leaders, seeking to breathe life into a White House effort that appears to have gotten off to a slow start. That effort has been further complicated by domestic troubles for Trump, Israeli Prime Minister Benjamin Netanyahu and Palestinian President Mahmoud Abbas. After initially welcoming the election of Trump, the Palestinians have expressed increasing frustration with what they say is a failure by the U.S. president to offer a clear vision for peace. Specifically, they are seeking a halt in Israeli settlement construction on occupied lands, and an American commitment to the establishment of an independent Palestinian state as part of a peace deal with Israel. "The U.S. envoys come empty handed," said Mahmoud Alloul, a top official in Abbas' Fatah movement. "That's why we will ask them whether they have answers about the basic issues. We will not deal with marginal issues." Related: Can Trump’s Ex-Lawyer Jason Greenblatt Achieve Middle East Peace? 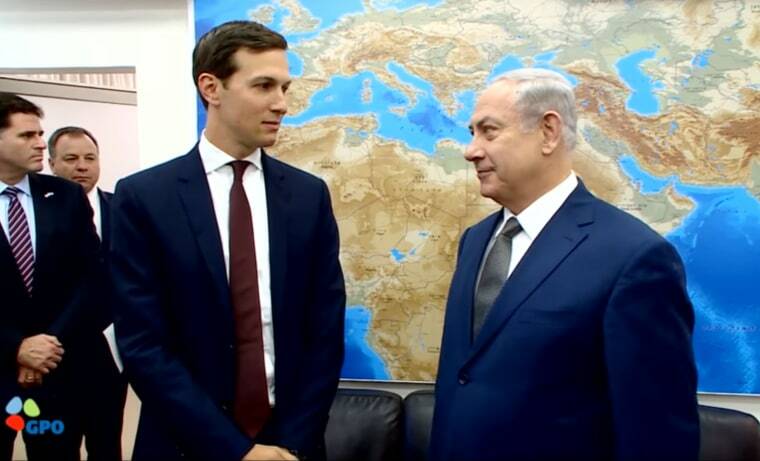 Kushner was meeting with Netanyahu in Jerusalem on Thursday afternoon, before heading to the West Bank city of Ramallah to meet Palestinian President Mahmoud Abbas in the evening. Kushner is expected to return to the U.S. on Friday. "We have a lot of things to talk about, how to advance peace, stability and security in our region, prosperity too," Netanyahu said, standing next to Kushner. "I think that all of them are within our reach." Kushner said Trump is "very committed to achieving a solution here that will be able to bring prosperity and peace to all people in this area." Trump took office with hopes of forging what he calls the "ultimate deal" between Israelis and Palestinians. But he has since given few details on his vision for peace, managing to frustrate both sides. On the campaign trail, Trump took a staunchly pro-Israel line. He promised to relocate the American Embassy from Tel Aviv to Jerusalem — a move welcomed by Israel and opposed by the Palestinians — and refused to endorse the Palestinian goal of independence. His platform played down the significance of Israeli settlements and he surrounded himself with a group of advisers with deep ties to the settlement movement, including Kushner. Still, he has not come out in support of the two-state solution, a position supported by most of the international community and also his Republican and Democratic predecessors. Disappointed Palestinian officials privately gripe that Trump's team has begun to support Israeli positions and ignore their concerns. Palestinian Foreign Minister Riad Malki told the Voice of Palestine radio station on Thursday that the Palestinians would be seeking "clear answers" from Kushner on settlements and independence. "Their answers to these questions will enable us to say if we have a historical chance for a peace process that can end the occupation or these visits are no more than a waste of time," Malki said. The atmosphere has been further complicated by troubles for all three leaders. Trump's administration has become preoccupied with a series of domestic crises, most recently the fallout from the deadly racially charged violence in Charlottesville, Virginia, earlier this month. Netanyahu, meanwhile, is facing a growing corruption investigation that could soon yield an indictment against him. These legal troubles, along with Israeli concerns about a possible long-term Iranian presence in neighboring Syria, make it unlikely that he will agree to any major diplomatic initiative. After years of on and off peace efforts that have yielded no progress, Abbas is deeply unpopular at home. He also is stuck in a bitter rivalry with the Islamic militant group Hamas, which seized the Gaza Strip from his forces a decade ago and is now pursuing a reconciliation deal with Mohammed Dahlan, a former Abbas ally who has turned into his political nemesis.